Do you know any girls who like the Alex Rider books, but wish they could read something with a female protagonist? A girl longing for a book about modern-day girls who doesn’t want to read about romance and fluff? Any kid at all who likes urban adventures, intrigue and spies? Kiki Strike is a book you cannot let slip under your radar. 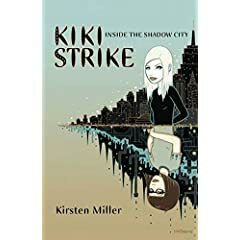 Twelve-year-old Ananka Fishbein describes her everyday life as ‘flavorless mush.’ Soon after an unexpectedly eventful Saturday when the park across the street turns into a sinkhole, she meets a new student at school: Kiki Strike, a white-haired, doll-sized girl with an air of mystery. Before long, Ananka is recruited to join Kiki’s all-girl team of explorers, the Irregulars, to map The Shadow City–the tunnels and hidden rooms buried under New York City. If this doesn’t sound exciting enough for you, consider this: Who IS Kiki Strike? Why does she want to explore the underground tunnels? Why are men in suits and dark glasses following the Irregulars’ every move? What does the exiled princess of Pokrovia have to do with any of this? Add international espionage, danger, daring, and characters that any kid, boy or girl, would love to hang out with, and you’ve got a fabulous and exciting read.